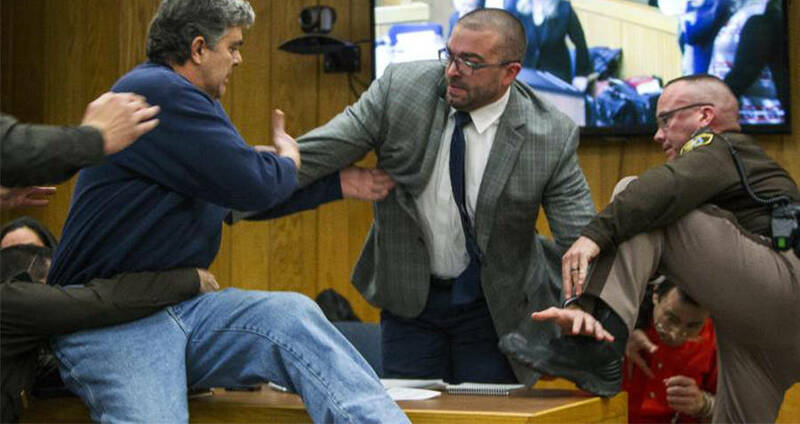 Randall Margraves, the father of three of Larry Nassar's abuse victims, lunged at the former doctor in open court. “Well, I’m going to have to,” Margraves said. Then he sprinted forward, lunging at the disgraced doctor. He managed to grab hold of Nassar’s lawyer’s arm while Nassar cowered behind him, before being tackled to the ground by court security officers. Margraves continued to yell as he was being detained, in full view of his daughters, and other parents of victims. As he struggled and was eventually handcuffed, his daughters could be heard crying in the background. As Margraves was helped up by the officers, Michigan Assistant Attorney General Angela Povilaitis spoke to rest of the victims and their families, all of whom were visibly shaken by the ordeal. “This is not helping your children,” she added, as Margraves was escorted out of the room. “You haven’t lived through it, lady,” Margraves answered. For those who had lived through it, it was clear that Margrave’s outburst was a sentiment shared by all. For the past two weeks, young women who were sexually abused by the former doctor for the United States Gymnastic team and Michigan State University have been reading powerful statements in open court. More than 150 women have spoken out about Nassar’s abuse since his trial began. Following a short break after the outburst, the proceedings resumed opened again by a statement from presiding Judge Janice Cunningham. Next, read about the man who sued God and actually went to court. Then, read about the court that ruled in favor of an impregnated 12-year-old.